YogaBar is a new concept by the founder of Fitness First and Fit n Fast that brings together food, fashion and fitness in one location. They have three studios in Sydney; one at Five Dock, one on Park Street and their first location, Westfield Shopping Centre. Take the escalator from Pitt Street up to level five (where the food court is) and you’ll find YogaBar’s wholefoods café with an active wear shop attached, selling brands like Lululemon, Nimble and Dharma Bums, and two fitness studios with classes in yoga barre, hot yoga and pilates. Time Out tried the yoga barre class, which was chock-a-block on Friday lunchtime. We took our position at the ballet barre, picked up a set of hand weights as instructed and got straight into pulsing plié positions. 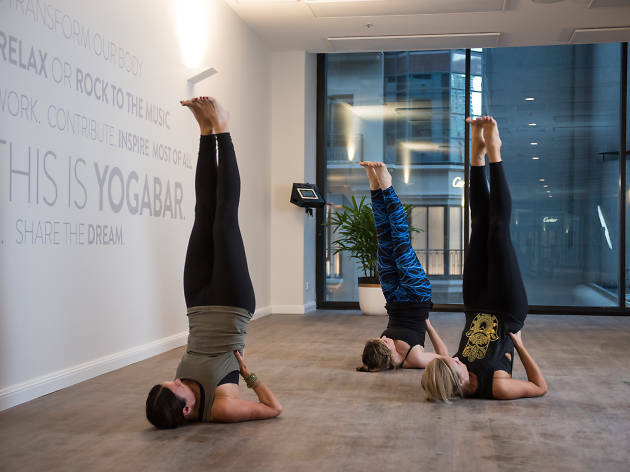 The 45-minute class doesn’t waste time with stretching or introductions – everyone is here to sweat as efficiently as possible before 4pm drinks at the office. It’s not for yoga or ballet purists, as the class borrows from both disciplines but at hard-core speed and to a soundtrack that includes Justin Beiber and Calvin Harris. Using the pink hand weights and an inflatable ball, we adopted ballet’s first and second position to work through leg and arm repetitions – holding the barre for stability. Our studio is mirrored on both sides, which made us feel pretty self-conscious, but it was a helpful tool for correcting our poses. It soon became clear that strong ankles were key to getting the moves right. As we moved through hip openers, bicep curls and ITB stretches, our instructor shouted, “feel the burn” and “work those muffin tops”, before moving on to double-time pulsing and an exercise version of getting low in a nightclub. All in all, it felt more like an aerobics session than a yoga class – aside from downward dog and plank positions; there was very little focus on yogic breath or classical yoga postures. But, we did work up a sweat in our lunch break and the healthy takeaway salads and smoothies available in the café made it a very convenient one-stop trip out of the office. Plus, if you need to spruce up for an afternoon board meeting, the change rooms are equipped with showers, lockers, hairdryers, straighteners and an iron/ironing board.